I made a skirt from a pattern I drafted myself. I made a skirt from a pattern that I drafted myself that was not an elastic waist. I made a skirt from a pattern I drafted myself with a zipper(!!). 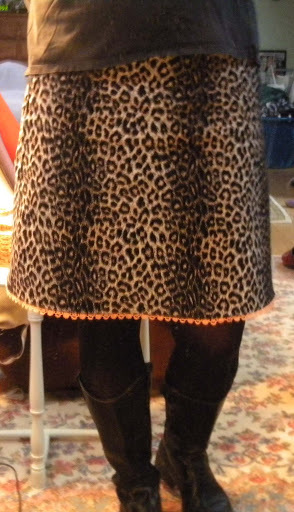 With sweet orange lace at the hem, which picks up the hint of orange in the leopard print fabric. I know from experience that heavier fabrics do better with proper enclosures versus elastic waists. I tend to shy away from zippers, although I have gotten decent at putting them into clothing. I realized that until this weekend, I had never used the zipper foot or the button hole function of my 3 year old machine. I am definitely a lazy sewer. Both are incredibly easy to work with – you can actually lock the proper buttonhole size in, which is a function I have never had in any of my old Singer sewing machines. I cannot tell you how much easier this makes the process. 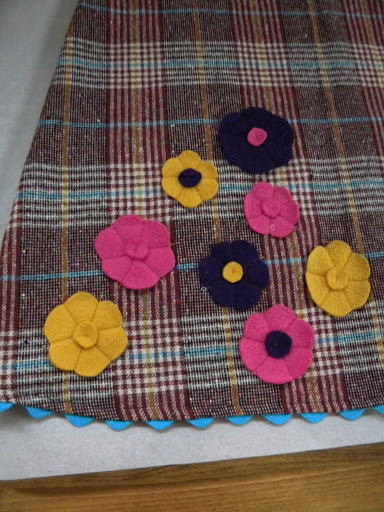 I’ve made my own skirt patterns before, using elastic at the waist, which means the only thing that needs to be precise is the length of your elastic. 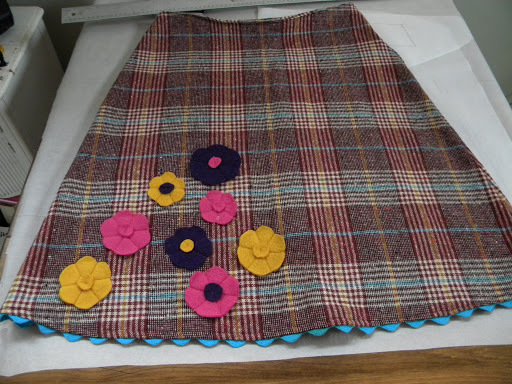 I read a few tutorials about drafting my own A-line skirt pattern, both online as well as in some of the sewing & clothing design books I have on my shelves. It’s a fairly easy process, one that if anyone would like me to share, I will. Otherwise, I will spare you the details and just let you admire my cleverness. I added a little too much ease into the waist and had to take it in. It is still just a wee bit too big in the waist, but that’s fixable. And bigger is always better than too small. I think my next skirt (because there is a small pile of fabric laying out on top of my ironing board right now, with several skirts planned because did I mention I’m sick of my wardrobe and have been sick of it since last October? Well I am). I’m going to try using some darts to see if that gives me a little bit better shaping in the waistline, which I’m going to make smaller. Yes, I made that too, a number of years ago. And it’s now far too big. This pattern actually served as a model for the new skirt. I need to take it a few inches, but then it should be wearable again. Which is good, because it’s awfully cute. Ultra-cuteness! Congratulations on the zipper! I'm skittish about them too, and buttonholes. My old Singer has few functions, well, zig zag if I ask it nicely. You're right, both skirts are super cute! Not just clever but totally AWESOME! Your ingenuity is always inspiring…is there anything you can't do? TOTAL cuteness! That one with the flowers is adorable.